The night before photographing the Black Friday Black Lives Matter protest, Nelson puts together his protest kit. "I'm very superstitious," Nelson said. "If one part of my kit is off, I feel like my whole day will be off." Nelson's "protest kit," includes his camera with extra batteries, two Go Pros, water, milk in case he gets pepper spray in his eyes, gloves, a Write In The Rain notebook, pens, and a recorder. 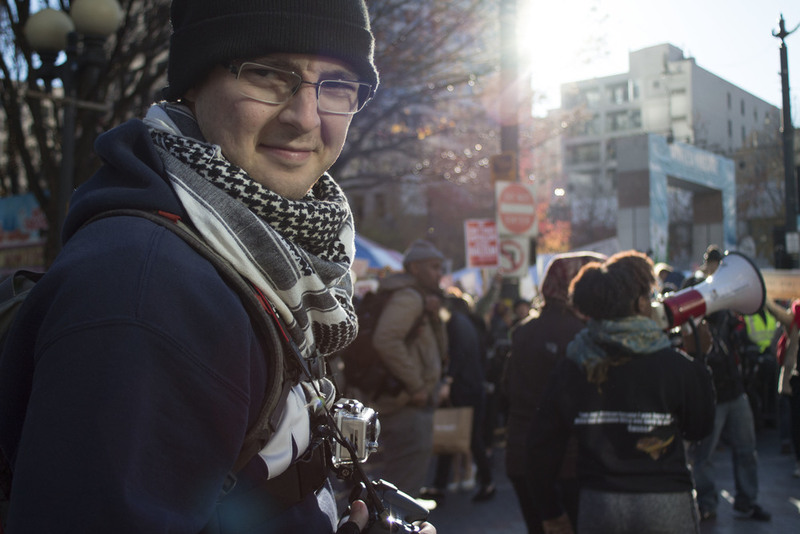 Nelson photographs the second annual Black Friday Black Lives Matter protest in Seattle on Nov. 26, 2015. Nelson waits for the start of the Black Friday Black Lives Matter protest at Westlake Center. Nelson glances around while photographing the Black Friday Black Lives Matter protest as the crowd moves through the streets of downtown Seattle. Nelson said he always tries to be aware and keep an eye on his surroundings. Nelson climbs up onto a lamp post to get a better view and some shots from a different angle of protesters at the Black Friday Black Lives Matter protest. Nelson walks toward the front of a crowd of protesters while photographing the Black Friday Black Lives Matter protest as the crowd moves through the streets of downtown Seattle. Nelson takes a break from photographing to talk to a videographer he recognized from high school about his camera rig. Nelson takes a break from photographing the Black Friday Black Lives Matter protest to tweet about the day's events inside of Westlake Center. Toward the end of the Black Friday Black Lives Matter protest, Nelson peaks over his camera and watches performers and protesters vie for attention during the annual tree lighting ceremony at Westlake Center. 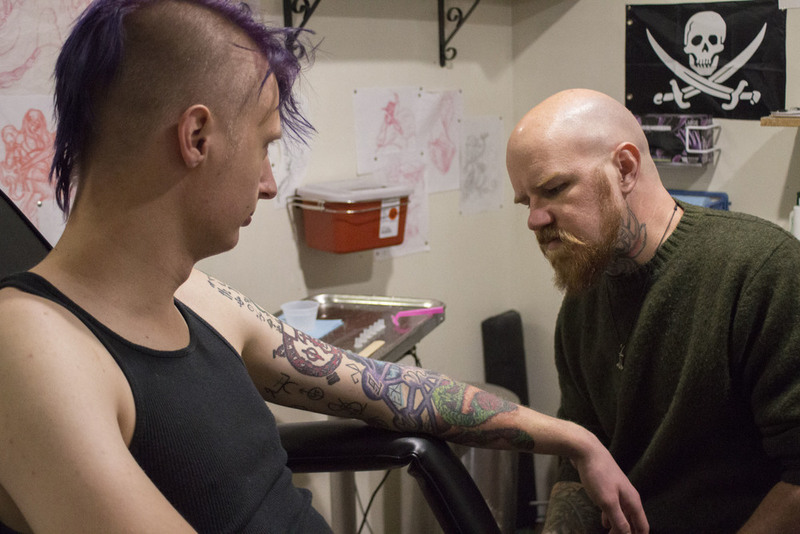 Ian Paterson, 22, catches up with long-time friend and tattoo artist Todd Bruce, 36, before a tattoo session outside of Chameleon Ink on State Street in Bellingham, Wash. on Nov. 24, 2015. The two will be continuing working on a tattoo inspired by author H. P. Lovecraft. Bruce offers Paterson a stick of gum before beginning their tattoo session. "It's because he doesn't want to smell my breath," Paterson joked. Bruce examines his progress on Paterson's tattoo sleeve before deciding where he wants to pick up tattooing. Bruce has been working on tattooing Paterson's sleeve for almost two years. "He won't let me tell him my other tattoo plans until we finish this," Paterson said half-grudgingly. Paterson smiles and jokes about having a "happy, happy, fun time" through the pain of being tattooed around the crease of his elbow. "What?" Bruce asked in response. "Did you say something, whiney meat-canvas?" 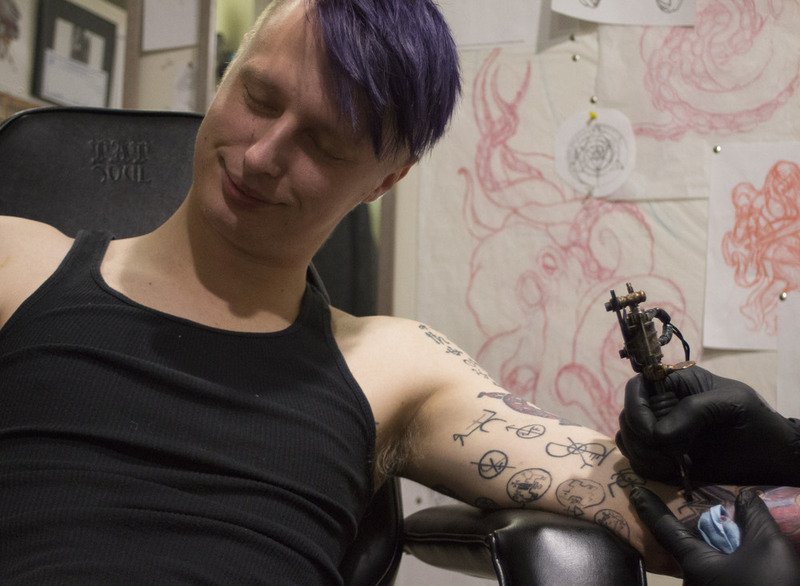 Paterson's face contorts in pain as ink is tattooed into the crease of his elbow. The elbow is one of the most painful places to be tattooed. Paterson and Bruce take a break from tattooing Paterson's elbow. Paterson and Bruce both immediately grabbed their phones after almost an hour and a half of work on Paterson's sleeve. Bruce and Paterson plan out the work that will be done on Paterson's sleeve in the next few tattoo sessions. Bruce plans on filling in large background portions of the tattoo, which will eventually look like parchment and the night sky before working on further details. Bruce wraps plastic wrap around Paterson's tattoo. Paterson will keep the wrap on for a 2-3 hours before washing his tattoo with soap and water. The plastic creates a barrier between the fresh tattoo and outside germs and bacteria.